The Aldi Spot - Helping You Save: Aldi Meat Special Buy! Now In All Aldi Stores? 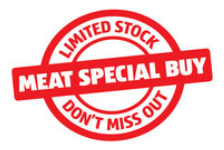 It seems that the weekly special called Meat Special Buy, which starts on Wednesday (October 12th) is now running at all Aldi stores. There is only a limited supply of this meat product, so this might not be available all week. Boneless Beef Chuck Roast is slow cooker ready with pre-cut potatoes, carrots, white onions, and celery. Includes seasoning packet.